Alex Gamutan is the President of Netaphils Inc. Davao City and is also currently the President of Exelcon Construction and Supply Inc. Davao City. He is an experienced agricultural engineer in the field of Greenhouse designing, Fabrication and Construction; Nethouse/ Nursery House design and Construction; Design, Supply, and Installation of Pressurized Irrigation System and Construction of Agricultural Infrastructures. Prior to his role at Netaphils, he also served as the Manager of AMCG Irritech Trading Center; Sales Manager of Netafim Phils and Sales/ Design Engineer of Plastro Phils Inc, Davao City. 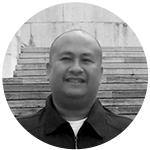 He holds a Bachelor of Science in Agriculture Engineer degree from University of Southeastern Philippines.